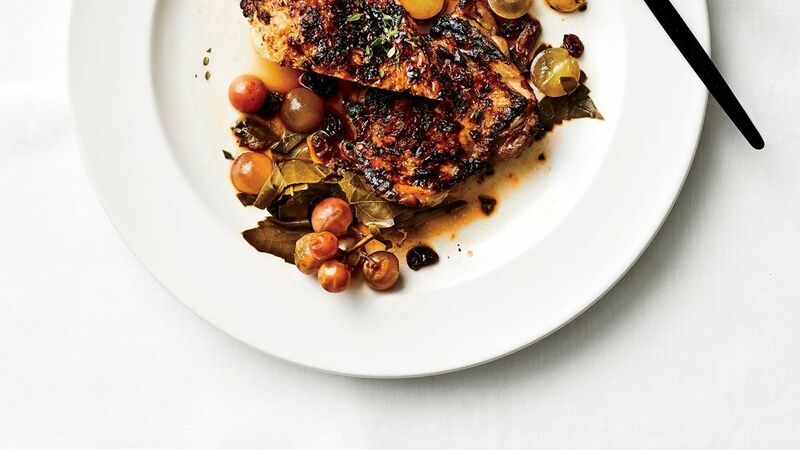 Best New Chef Katianna Hong, of The Charter Oak in St. Helena, California, works with nearby vineyards to get some of the components of this grilled chicken dish, made with fresh grapes, raisins, house-preserved grape leaves, and verjus. Dried grapes plump up in tart verjus—a vinegar alternative made using the juice of “green,” or unripe, grapes. Her buttermilk brine for the chicken is genius, to boot. Combine grape leaves, 3 cups water, and wine in a medium saucepan. Bring to a boil over medium-high. Reduce heat to medium-low; cover and cook until tender, about 3 hours. (Alternatively, cook grape leaves, wine, and enough water to cover in an electric pressure cooker on high until tender, about 1 hour.) Hold grape leaves in liquid until ready to prepare the sauce in step 7. Preheat oven to 425°F. Combine chicken leg quarters, onion halves, carrots, and celery in a large roasting pan. Roast in preheated oven until chicken is golden brown, about 1 hour. Reserve 1/4 cup pan drippings. Transfer roast chicken, vegetables, and remaining pan drippings to a large stockpot. Add 4 quarts water, and bring to a boil over medium-high. Cover, reduce heat to medium-low, and simmer 6 hours. Pour chicken mixture through a fine wire-mesh strainer into a large bowl; discard solids. Heat 2 tablespoons reserved pan drippings in a large, high-sided skillet over medium. Add shallots and minced garlic; cook, stirring often, until softened, about 3 minutes. Add thyme sprigs and strained stock. Simmer over medium until reduced to 2 cups, 2 hours and 30 minutes to 3 hours. Discard thyme sprigs. Set roast chicken jus aside. Reserve remaining 2 tablespoons reserved pan drippings for finishing. Stir together buttermilk, 1 cup water, sliced onion, brown sugar, hot sauce, salt, pepper, and smashed garlic in a large bowl. Add chicken breasts and thighs; toss to coat. Cover and chill 24 hours or up to 36 hours. Open bottom and top vents of a charcoal grill completely. Light charcoal chimney starter filled with briquettes. When briquettes are covered with gray ash, pour onto one side of bottom grate of grill. Maintain internal temperature at medium-high (400°F to 450°F). Remove chicken pieces from marinade. Place chicken on oiled grate over side with coals, and grill, uncovered, until grill marks appear and chicken releases easily, about 10 minutes. Flip chicken, and move to side of grill without coals; grill, uncovered, until a thermometer inserted in thickest portion registers 165°F, about 20 minutes for thighs and 30 minutes for breasts. Place grape clusters on oiled grate over side with coals, and grill, turning often, until softened and charred, 8 to 10 minutes. Cool grapes 10 minutes; remove and discard stems. Heat 2 cups roast chicken jus in a medium saucepan over medium until warm, about 5 minutes. Add grilled grapes, fresh grapes, raisins, 1/2 cup chopped brined and cooked grape leaves, 1 tablespoon liquid from brined and cooked grape leaves, and 1/2 teaspoon salt. Cook until heated through, about 2 minutes. Stir in desired amount of verjus rouge, and add salt to taste. Place 1 chicken breast in each of 3 shallow serving bowls and 2 thighs in each of 3 other bowls. Spoon sauce evenly over chicken. Drizzle with remaining reserved 2 tablespoons warm pan drippings; sprinkle with chopped thyme. Review Body: I'm sorry but did I just read to roast 6 chicken leg quarters and then "Pour chicken mixture through a fine wire-mesh strainer into a large bowl; discard solids" !?! wtf, discard the chicken legs? Does anyone else have an issue with that technique?